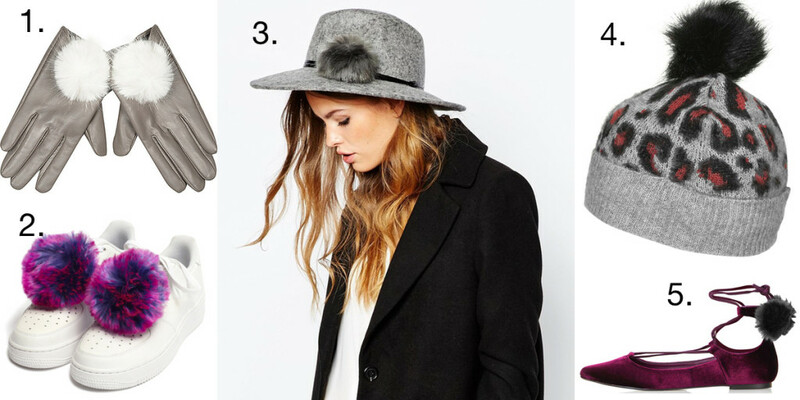 I’ve hunted down the best pom pom covered accessories on the high street to give the pom pom obsessed lady this Christmas. You really are very welcome. 1. If chic and sophisticated is your thing then these Grey Leather Pom Pom Gloves are for you (or that friend you’re meant to be buying for). I strongly believe you can’t go wrong with a pair of plush gloves as a Christmas gift. And these aren’t bad for £25. 2. For the pom pom obsessed, look no further than these Pom Pom Shoe Clips from Cleo B. My favourites are these ombre purple ones, guaranteed to take any pair of shoes to the next level. Yours for £35. 3. Every hat lover needs a good fedora in their collection. This Catarzi Wide Brim Pom Fedora is the ultimate, made from felted wool with a contrast trim and of course, added pom pom. Plus, it’s currently on sale for £24.50. You’re welcome. 4. I am a massive lover of beanies and like to get a new one each year to add to my collection. This time, I’ve fallen for Topshop’s Leopard Knit Beanie Hat, £14, for three obvious reasons. Neutral grey + leopard print + cute black pom pom = one very happy animal-print obsessed lady this Christmas. 5. What could be better than mulberry-coloured, lace-up velvet flats? Mulberry-coloured, lace-up velvet flats with added pom poms. That’s right, Topshop are making all my dreams come true this winter with their Finest Pom-Pom Velvet Ghillies and at only £29, you can’t argue with that. Topshop, you’re spoiling me. Go forth and pom pom.